There are various versions of the AmpliTube for iPhone software. PRESS RELEASE: IK Multimedia is pleased to announce AmpliTube iRig: the ultimate mobile guitar amp and effects rig system for iPhone/iPod Touch/iPad. AmpliTube iRig is a combination of an easy-to- use instrument interface adapter for iPhone, iPod Touch and iPad mobile devices, and the new AmpliTube for iPhone software for guitar & bass. You'll have at your fingertips the sound and control of 3 simultaneous stompbox effects + amplifier + cabinet + microphone just like a traditional guitar or bass stage rig! 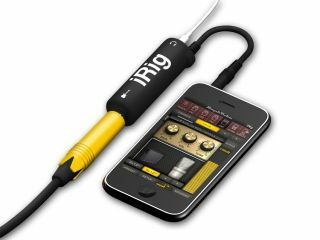 The new iRig interface adapter is the easiest way to get your instrument's signal into your iPhone/iPod Touch/iPad mobile device. Simply plug iRig into your mobile device, plug your instrument into the iRig, plug headphones or amplifier to the output and you are ready to rock! Now AmpliTube for iPhone gives you incredible, ultrarealistic sound and functionality in a convenient mobile platform app. With the AmpliTube for iPhone software, you'll have an entire guitar/bass rig at your fingertips, comprised of 3 simultaneous stompbox effects, an amp-head plus cabinet and a microphone. AmpliTube iRig: $39.99/€29.99** MSRP and is already available for pre-orders from the IK online store as well as from IK selected dealers and distributors worldwide. AmpliTube LE: Includes 4 stompboxes, 1 amplifier + cabinet, 2 microphones for $2.99/€2.39. More gear can be added to FREE and LE through in-app purchase of a-la-carte models with stompboxes costing $2.99/€2.39 each and amplifiers + cabinets for $4.99/€3.99 each. AmpliTube FULL: Includes the entire collection of available gear with 10 stompboxes, 5 amps + cabinets and 2 microphones for $19.99/€15.99.